Sports Wall Decor that is easy! Our sports silhouette decals transform rooms in minutes! They are perfect for decorating gyms, sports stores, living spaces,workout rooms, fitness centers, sports bars, sports complexes, weight rooms, hallways, schools, locker rooms, etc. These sports vinyl wall decals are durable, easy to apply, and very realistic. Our silhouette material is so thin it looks like the silhouettes are painted on the wall (but with crisp edges and a lot more detail). Our permanent vinyl is waterproof (washable) and resistant to UV rays, fading, and tearing. It's great for public areas or outdoor settings. We make our sports silhouettes from the same material other companies use for high-performance automotive graphics. Our vinyl decals work on almost any smooth surface: as wall stickers, on windows, glass, mirrors, painted wood, plastic, metal, signs, cars, boats, etc. Every order comes with application instructions and a practice decal. You won't be disappointed! Don't want your sports decals to be permanent? We also offer removable vinyl for those who want a quality product but easy removal. Fast shipping! Expect your sports silhouettes in 5-8 business days (US). Rush orders and expedited shipping available. All of our work is top-notch and very affordable. We look forward to working with you! What are vinyl silhouette sports decals? They are a great way to quickly and easily transform bare walls into places that inspire. 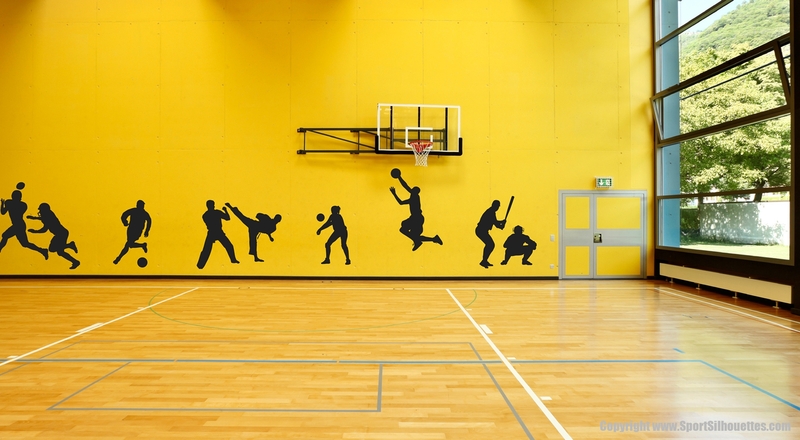 Our sports silhouette wall decals are ideal for decorating gyms, sports stores, living spaces, workout rooms, fitness centers, sports bars, sports complexes, weight rooms, hallways, schools, locker rooms, etc. They can be applied to most smooth surfaces including: walls, glass, mirrors, painted wood or canvas, metal, cars, signs, boats, etc. They are durable and easy to apply. They are so thin they look like they are painted on the wall (but with crisp lines and a lot more detail). Our permanent vinyl is waterproof (washable) and resistant to UV rays, fading, and tearing. It's great for outdoor settings or public areas. Our removable vinyl is also high quality, but offers easy removal. What is the difference between removable and permanent vinyl (adhesive)? Removable vinyl is great for indoor areas safe from prying fingers. It looks great, but can be peeled off fairly easily. It has a matte finish. Permanent vinyl has a much stronger adhesive and is great for public areas and outdoors. It can take abuse, is waterproof (washable), resistant to UV rays, fading, and tearing. It too can be removed, but not without some difficulty. Permanent vinyl has a glossy finish. What is the cost difference between a sports silhouette made in removable or permanent vinyl? There is no difference, the cost is the same. What do you mean by "life-size"? How do you determine the size of your "life-size" sports silhouettes? We use the average height for the estimated age of the athlete in the silhouette and make slight adjustments. For instance a 100% life-size silhouette decal of a man standing would be near 6 feet tall. By using this method all 100%, 75%, 50%, and 25% life-size athletes match each other respectively and can be used together on the same wall or surface. What type of surfaces will my sport silhouette decals adhere to? Your vinyl decals will stick to most clean smooth surfaces. Heavily textured, rough or uneven surfaces are not recommended. Some of our most popular uses have been on walls, windows, glass and mirrors, metal, sign boards, plastic, painted wood, doors, cars and boats. They stick to some kinds of cloth. Test your destination surface with our removable practice graphic (included with every order) to make sure it works well. Will the sports decals stick to a textured wall? Yes and no. The sports silhouettes just need to have lots of contact with the wall. If the texture is very light and mostly flat they should stick fine. If the wall texture is heavy, has protruding peaks, spurs, or is not mostly flat (like "orange peel" texture), then the decals will not have enough surface area to adhere to. Test your surface by placing on it an average sticker of any kind. If that works fine, our high quality material will probably work better. We cannot make any guarantees they will work in your situation, but for textured walls we recommend you choose the permanent vinyl option (instead of removable) because it sticks better. Will the sports decals work on a painted cinderblock wall? Maybe. The sports silhouettes just need to have lots of contact with the wall. If the cinderblocks have a really good quality coat of paint or have been painted multiple times, they probably now have lots of smooth surface to adhere to. If they are still not relatively smooth with lots of spurs and protruding texture, then the protruding texture will keep the silhouettes from reaching the smoother, secure wall surface. Another consideration is the mortar between the bricks. If the mortar is relatively level with the brick/wall surface (and is painted well), it will probably work. If the mortar is not relatively level with the wall but is concave, it will make it hard (but not impossible) to apply the decals to the wall without them being suspended as they bridge the gap between bricks. We cannot make any guarantees our sports decals will work in your situation, but for all textured walls we recommend you choose the permanent vinyl option (instead of removable) because it sticks better. Which dimension comes first, width or height? Width comes first, width x height. If I remove a wall silhouette will it damage my wall? Removable vinyl can be peeled off fairly easily. We have never known of a single case when our product has caused wall damage. However, we cannot guarantee there will never be a problem nor be responsible for damage: use at your own risk. Permanent vinyl sticks much better and could take off loose paint or cause similar problems. How do I apply my sports decal? Applying your sports decal is quite easy. All you have to do is peel off the backing paper, stick the decal on a clean smooth surface and then peel off the transfer tape. Every order comes with application instructions and a practice decal. See our Application Instructions page for more details. Can I use my vinyl decal outside on a sign, car, boat, etc? You bet, just be sure you select the permanent vinyl option. We make our permanent vinyl decals out of the same material used for high-performance automotive graphics (not the cheap vinyl). It is waterproof, resistant to UV rays, fading, and tearing. It can handle all kinds of weather and conditions. Yes, anywhere in the world. About 5-10 business days (in the U.S.). For faster service, there is an additional rush order option available during checkout and expedited shipping. Will my sport silhouette decals come ready to apply? Yes, your sports vinyl decals will come ready to apply with the transfer tape already on them. Every order comes with application instructions and also a practice decal. Are your vinyl decals reusable? How long should I let new paint cure before applying my vinyl silhouette? New paint has an oily surface until it is fully cured. Allow a month for new paint to cure before applying your sports silhouettes. Test the surface with the practice decal included with every order. Yes, just contact us and let us know what size you would like. What type of photo do I need for a custom silhouette decal? Most digital camera photos work great! Higher resolution (larger) pictures make the best custom silhouette decals.  Please upload the original image from your camera (the largest file). Some computer programs automatically shrink photos for emailing. A full-size digital picture should be at least 1 megabyte (1MB=1000K). What if I'm not sure my photo will make a good silhouette? Sent it to photos @ sportsilhouettes.com for a free professional evaluation. 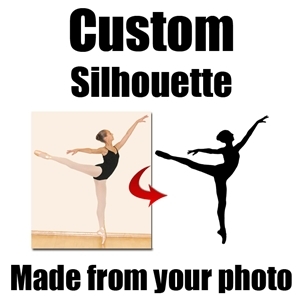 What if the photo I want to use for my custom silhouette has other people in it? No problem, just indicate in the special instructions box what you want us to do. Can my custom sports silhouette decal be exactly life-size? Sure, we will cut the silhouette to match exact dimensions--and it is easy--just let us know how tall you want it in the special instructions, and be sure to purchase a decal size limit large enough to accommodate your requested silhouette size. Why don't you offer smaller custom silhouette sizes? Your custom silhouette decal can be any size up to the size limit you purchase. Our first tier is "up to" 22 x 36 inches. The reason for this is because most of our cost is in the creation of the silhouette (creating a mathematical object for cutting) and not the material. It is time intensive. Can I see what my custom silhouette will look like before I make a purchase? Most of our cost is in the creation of the custom silhouette and not the material. It is very time intensive to create a mathematical cuttable silhouette object. For this reason we do not begin work on the custom silhouette until after the order is placed. Will you send a proof of my custom silhouette decal? Certainly. We will email you an image of the finished custom silhouette for your approval before we make it into a decal. How big can you make a vinyl decal? Single piece decals can be up to 11 x 4 feet (3.4x1.2 meters). Larger decals can be divided up into sections that size. Really there is no limit on how big we can make a decal. 11 x 4 foot sections can be placed together to create enormous images. How should I store my vinyl sports decal until I am ready to use it? Our vinyl sports silhouettes should be stored in a closed container. The backing paper needs to be kept dry. For us, there is no difference. We use the terms interchangeably. Can I get the outside of the sports silhouette (or lettering) instead of the inside to use it as a stencil? Absolutely, just place your order and let us know that is what you want in a reply to our order confirmation email. Some people have used the outside of our vinyl as stencils for glass etching. How do I remove my sports decal? With tweezers or your fingernail, grab the corner of the decal and pull it off at an angle. If needed, the vinyl decal can be warmed up with a hair dryer to loosen the adhesive. Can I design something and have you make it into a vinyl decal? Yes, we do this frequently. Just contact us for a price quote. Will my large sports decal come in one piece? Most of the time, yes. If the vinyl sports decal you purchase is larger than 11 x 4 feet it may come in more than one piece. If so, the pieces should to be placed together slightly overlapping. Our vinyl decal material is made for overlapping. It so thin it is hardly noticeable. We create custom art to the specifications of our customers. Each purchase is made to order. For this reason we do not allow returns. We keep your email address completely private and do not store any financial information whatsoever. Absolutely. The vinyl is so thin, you can easily overlap decals for special effects. It so thin the overlapping is hardly noticeable. Can I use the "wet method" to apply my permanent vinyl decal? Thank you for visiting! If you still have an unanswered question, please ask! Contact us here. No worries, applying your sports silhouette decal is easy. But, to make it even easier we include a practice decal (and written instructions) with every order. That way you can get the hang of applying it and test out your destination surface before putting your it up. Remove the masking tape sections from the edges. Place your sports decal where you want it to go. Tape one side (edge) to the surface. Lift up the other side of the sports decal using the tape as a hinge. Peel of the white backing paper. Place the sports silhouette back onto the surface. Rub it down with your hand. Peel off the clear transfer tape from the bottom of the image to the top. You are done! It is that easy. VINYL DECAL PREP: Clean the destination surface and dry it thoroughly. Please allow a newly painted surface a month to fully cure before application (it remains oily for a while). Remove or cut the small masking tape sections along the edges. 1. Place the sports decal on the destination surface. Level and center it. Pay special attention to level and center the silhouette itself and not the backing paper/transfer tape. 2. Tape one edge of the backing paper/transfer tape to the destination surface. Lift up the other side using the tape as a hinge. At a tight angle, slowly peel away the white backing paper underneath exposing the sticky vinyl. The vinyl decal should stay adhered to the clear transfer tape. If it starts to separate, help it stay together. 4. Gently peel away the transfer tape starting from a corner pulling at a tight angle across the sports decal. Be patient and go slow. If the decal begins to lift up help it stay down. Once the transfer tape is removed, rub the sports decal down one last time to make sure it is well adhered. You are done! SHARE: Please post about your sports creation and reply to your order confirmation email with a link to your post. We would love to feature you on our website.